I wasn’t even going to review this wine. I went down to my basement tonight and grabbed a bottle of what I thought was just an everyday drinking wine, but what a surprise! The nose is full of sweet scents of pear and vanilla with hints of oak. This is a medium bodied wine with pineapple and tropical notes, layered with honey and butter. The texture is soft and round. I like that the nose is so full of aroma, it compliments the taste of the wine and adds another dimension to the whole tasting experience. This was another Safeway wine on sale at just $13.49. It hails from the Russian River Valley, one of my favorite wine producing regions. 13.9% in alcohol. This is going to become a regular in my wine rack! Tonight I’m trying one of my new “box” meals from Hello Fresh. This is one of those companies that promises to send you all of the fresh ingredients, right sized for two people or four, complete with cooking instructions. Well, I can’t start cooking without a glass of wine, can I? So read with me while I try this Chloe Chardonnay made from grapes from Sonoma County. There are nuances of oak and vanilla in the nose. This is not a big, bold, complex chardonnay but the mouth feel is a real pleasure. Lots of legs on this wine, with a beautiful, light golden color. With a creamy, silky finish, this is a sophisticated and refined wine. It is a delicious wine to sip all by itself or with food. I paid $11.69, on sale at Safeway, for this wine. 13.5% in alcohol. Enjoy! I was very excited to stop by this winery during our trip through Mendocino and Sonoma Counties last fall. 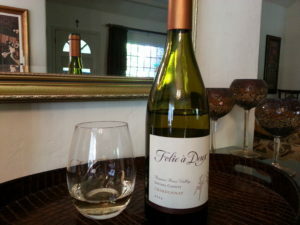 It was on my list of recommended wineries from a blog I read before we headed out to wine country. The winery itself was plenty busy on a Friday afternoon and the staff was very friendly. At first, I couldn’t detect much in the nose, but the second pour revealed a slight scent of freshly sliced fruit. This is a rich and creamy, well-structured wine with a very pleasant mouthfeel. It is layered with ripe fruit characteristics and a hint of vanilla. Enjoy the ripe, full roundness on the palate. The color is light golden in appearance, and the wine has plenty of legs. Alcohol is 14.4% in volume. The wine sells for $30 at the winery which is where I purchased it. Or, check Vivino.com for prices from $22.99 to $26.99. Matchbook Wine Company is quickly becoming one of my favorite wineries, producing as many as five different chardonnays. The winery produces four different brands of wine: Matchbook, Mossback, Chasing Venus, and Sawbuck. Located in Dunnigan Hills, about thirty minutes north of Sacramento, Matchbook has a beautiful facility overlooking their vineyards on rolling green hills. 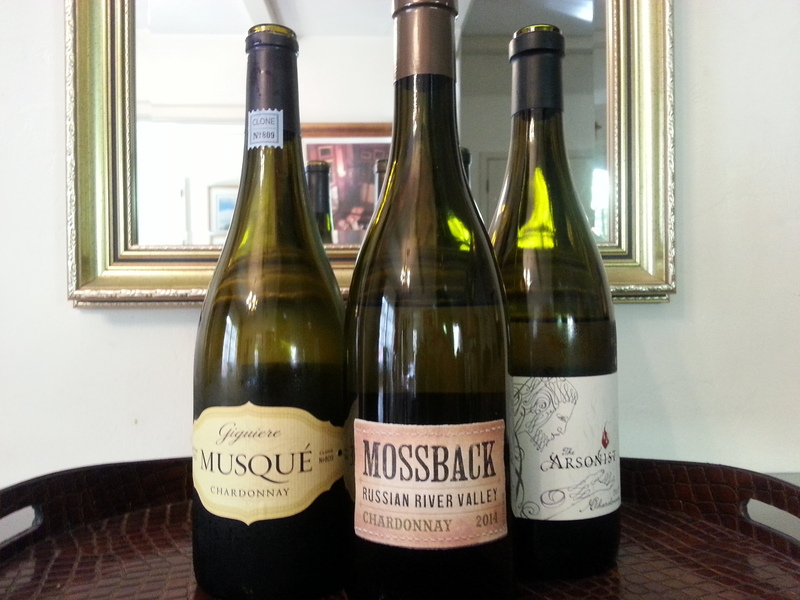 To compare and contrast, today I am tasting three of their most popular chardonnays. Mossback is an old fashioned term for farmers, and the owners, being grape growers as well as winemakers, can identify with the profession. Apple and citrus aromas with a hint of vanilla waft up from the glass of this wine produced from grapes out of the Russian River Valley. 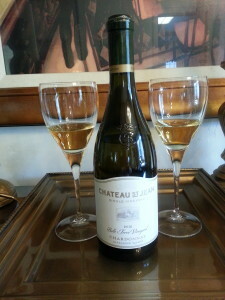 It has a rich and creamy texture, and is soft and round on the palate. There is some acidity in the finish. Although this wine is softer and milder, lacking the butterscotch flavor that I typically find in a Russian River Valley chardonnay, it is lovely and quite drinkable. The alcohol is 13.9%. It sells for $17.99 a bottle in the winery. Musque is the French term meaning both perfumed and muscat-like. What a beautiful nose, truly perfumed, enhancing the tasting experience with such wonderful smells. The wine itself is layered with honeysuckle, orange blossom and pear overtones. The body is thinner than the Mossback. It is round, soft, and has a lingering finish with a hint of apricot at the end. The alcohol is 13.5%. This wine sells for $15.99 a bottle at the winery. The winemaker describes this as a big, rich, creamy, full flavored chardonnay and I have to agree. This is my favorite wine at Matchbook and very closely matches what I have been looking for in that “good, old-fashioned” style of chardonnay. I smell toasted oak and hints of vanilla in the nose. This has a rich, creamy mouthfeel. This is what chardonnay should taste like. The flavor of the grape comes through in this wine and is not overpowered by the French, American, and Hungarian oak barrels in which it was aged. There is a taste of sweet caramel in the finish. The wine is 14.3% in alcohol. It sells for $21.99 a bottle at the winery, but is also widely available commercially. Look for it on sale at your local grocery store.